Starting a successful online business while still working your nine-to-five is a path that many e-entrepreneurs are on, but only few succeed. 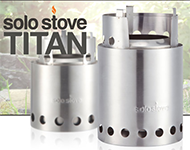 Jeff of SoloStove.com is one of those successful “undercover” e-store owners. Over the past few years, he has built a beautiful lucrative online business while working a full time corporate job during the week. In this week’s episode, you are going to find out what it takes to create an e-commerce business with a limited amount of time and many external constraints. Jeff joins me on show to share exactly how he did it, what marketing methods he used and his exit plans from his day job in the near future. How Jeff managed to find the time to build his e-commerce store working a full time day job. Jeff’s entrepreneurial mindset and how he got there. How Jeff marketed his business. How Jeff and his partner came up with and developed an impressive promotional video for their product. Jeff’s plans for the near future. Each week we’ll be rewarding one special listener with a prize from one of our previous contributors. Congratulations to Joshua McFall of TritonMobility.com for winning this week’s prize! Please reach out to us via the contact methods below to claim your prize. Enjoy it Joshua, and thanks so much for listening. Kudos Jeff and congrats! Can’t wait for your next podcast with Andrew once you have hit 100% of your goal! Loved your video approach like what Andrew has mentioned, making it a very unique experience conveying your brand. Great job Jeff. It’s encouraging to hear that you were able to create such a solid business while you were working a full time job. It’s easy to create a solid company while working full-time if you steal the product design from someone else! Google it.